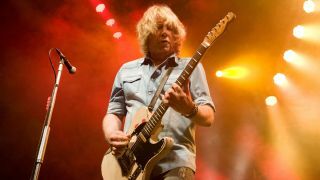 Status Quo guitarist Rick Parfitt has died in Spain at the age of 68, his manager has confirmed. He was admitted to hospital on Thursday due to complications related to a shoulder injury, and died from a severe infection. With bandmate Francis Rossi, Parfitt formed one of British rock's most famous and beloved partnerships. After limited success with a psychedelic sound in the late '60s, Status Quo quickly evolved into a boogie rock act, building a loyal fanbase that withstood numerous changes in musical fashion. They famously opened Live Aid in 1985 with Rockin' All Over the World. Speaking to our sister magazine Total Guitar earlier this year about their breakthrough in the mid-'70s, Parfitt said: "It was great. You've been playing these poxy little clubs. Then all of a sudden you find yourself doing Wembley Arena, and you start to feel like a rock star. You start to take on this kind of attitude, y'know, the iconic legs-apart stance that Alan Lancaster [bass], Rossi and myself had. "It was just a wonderful time. Anything was possible. You're young. You're earning a lot of money. You're getting famous. Your albums are going to number one. You've got songs coming out of your ears. I think we found out what we were in the '70s, which is this blues-based, hard-rocking band." Parfitt was known for his battered Fender Telecaster, and was happy to joke about his band's reputation for only knowing a limited number of chords. "I saw The Kinks at the Taunton Odeon [in the '60s]," he told Guitarist. "Then I used to go to see beat groups at the local Co-op venue. Every time I went along, I'd watch the guitar player and learn a new chord. I only went to three shows, of course."